"...if you do not happen to live on the Mediterranean, you cannot obtain the particular rockfish, gurnards, mullets, weavers, sea eels, wrasses, and breams which they [French experts] consider absolutely essential. But you can make an extremely good fish soup even if you have only frozen fish and canned clam juice to work with because the other essential flavoring of tomatoes, onions or leeks, garlic, herbs, and olive oil are always available." 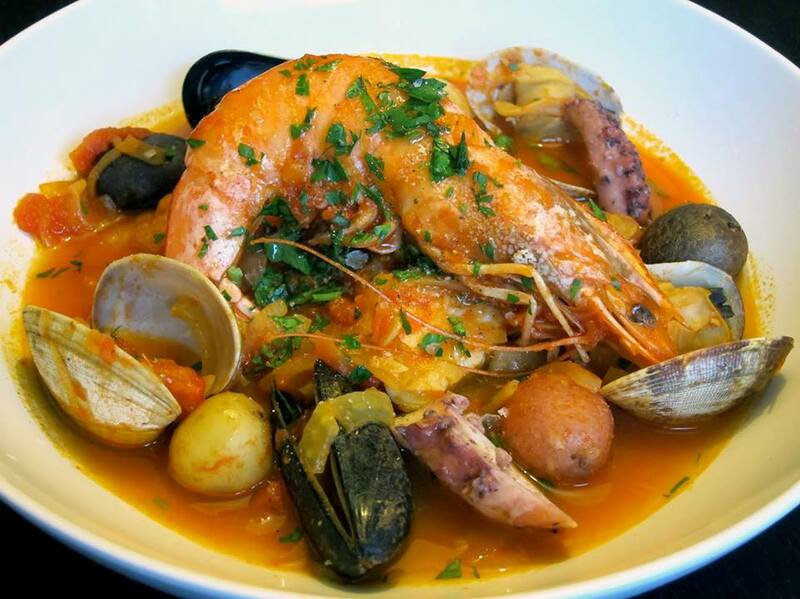 Bouillabaisse is a fish stew that originated in Marseilles, France around 600 B.C.. Yes, B.C. Marseilles was a Greek colony at this time and being such as known as "kakavia." Bouillabaisse also appears in Roman mythology as a soup that Venus feeds to Vulcan. You may think that it is some mystical and complicated culinary creation. The truth, as you will see, is it is a simple dish. Use whatever fish you have access to. Shellfish is nice, but certainly not a necessity. This can be a GREAT new addition to your holiday menu. Follow the rules of Kashrut and it can be a wonderful main dish for Hanukkah. Add a couple more types of fish and you have all of the fish needed for an Italian Christmas Eve celebration. Add olive oil to heavy bottomed casserole or cast iron pot on medium heat. Add onions and leeks. Cook until just softened (2-3 minutes), stirring occasionally. Add garlic and cook 30 seconds, then tomatoes and paste. Stir to combine. Cook for 4-5 minutes. Pour in water and stir. Add bouquet garni, potato, fennel seeds, orange peel and fish bones. Raise heat to a slow boil, cooking for 20-30 minutes. Remove potato and put aside. Strain the soup, pushing on the bones to get all of the flavour out. Taste for seasoning. Add salt and pepper if needed. Return broth to the pot and bring to a boil. Add lobsters and any firm fish, i.e. snapper, halibut. Cook on a boil for 5 minutes, then add the more delicate fish, shrimp, clams etc. Cook 5 more minutes. Remove fish from the broth to a serving platter. Taste broth for seasoning again and ladle into a tureen. Serve on rounds with rouille. Place the bell pepper, tabasco, potato, garlic and basil in a food processor. Pulse for 10 seconds 3 or 4 times. Then with blade running slowly pour in olive oil until a smooth paste has formed, but with a bit of texture. Serve on bread rounds or in soup. It is best to eat the soup and fish separately, but it is up to you. A nice crisp rose wine goes GREAT with this as does champagne.